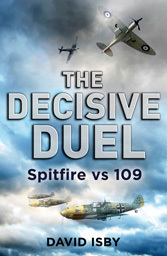 One of the many things I wish I had found the space to fit into THE DECISIVE DUEL was an explicit comparison between the development of the Spitfire 21 and the Me 209. Neither aircraft made much direct impact on the Second world war. The Spitfire 21 flew a relatively few combat sorties in 1945. The Me 209 was, of course, never produced, and effectively represented the terminal point of the development of the 109. The Spitfire still had a few steps to go, the Marks 22 and 24 (basically tweaked Mark 21s), the Seafire Mk 47 with its contra-rotating propeller (and its Mk 45 and Mk 46 forerunners), and the Spiteful and Seafang, end of the line not only for the Spitfire design, but also for the piston-engine fighter. Both the Spitfire 21 and the Me 209 had long and costly developments. The underlying reason was the same for both. Their basic designs and the whole concept of the piston engine fighters were being pressed to their limits. Much investment was required for marginal increases in performance that had to be paid for by making the design overpowered and potentially lethal to the average wartime fighter pilot. Willy Messerschmitt may have been among the first to see that the future of the fighter was with the turbojet, but by mid-war there were few designers in any of the major combatants that would have disagreed. The Spitfire 21 became a success, not in combat but as a “risk mitigation” option for Britain’s first-generation Meteor and Vampire jet fighters and in years of post-war service, while the Me 209 proved only a dead end. This reflected the greater resources the British had for research and development of new aircraft. They could make the Spitfire 21 work. It also represented that the basic Spitfire design, a little larger, a little later and a little more flexible than Messerschmitt light fighter, could better expand and adapt to a more powerful engine. It also reflects Rolls Royce could pack more horsepower per cubic measure than anyone in the world. Metallurgy undercut German engine design. Just as they could not make a Jumo 004 turbojet with a life of over 15 hours, the basic Daimler Benz philosophy of big, slow-turning engines made it hard to integrate with the 109 airframe. The Fw 190, bigger and a few years later, offered the potential that led to the Fw 190D and Ta 152.